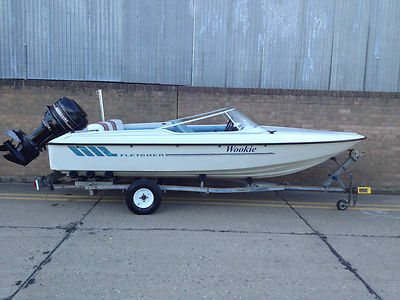 Home » Fletcher Boats » 17ft Fletcher Speedboat, 75hp Mercury Outboard And Snipe Trailer, Ski Boat. 17ft Fletcher Speedboat, 75hp Mercury Outboard And Snipe Trailer, Ski Boat. For Sale 17ft Fletcher Speed boat complete with 75HP 2 stroke Mercury outboard and galvanised Snipe trailer, big ally anchor, too fuel tanks, life jacket, flush muffs etc. The engine is very sound and up together, starts on the key every time, electric tilt and trim, it was serviced last year and used twice since, very clean, nearly new propeller, very powerful, made buy mercury solid bullet proof and sought after. The boat 17ft built buy fletcher, nice solid stable uptogether boat all dials and electrics work built in bilge pump quicksilver throttle mechanism with tilt and trim buttons, built in chrome ski pole, as mentioned electric start. Few marks here and there as would be expected, it is a used boat interior a bit shabby in places back seat dosent match again it is a used boat, but generally good, nice looking thing. The Trailer built buy snipe very good quality, all rollers roll freely, brand new wheels and tyres fitted today, all bearings removed and regressed as there relativity new, nice solid trailer. ready to tow anywhere. Nice little set up ready to hook on you’re car and go have some fun with just add water, its not new buy any means but in my option all round good condition, new owner wont be disappointed with it and especially its performance im sure.. can be seen running you’re welcome to view. Cash on collection to big to post, No reserve will go to the highest bidder.